"My husband has many, if not most, of the traits of Asperger’s Syndrome. But he refuses to talk about it or go for a diagnosis. Instead, he says I’m just blaming him for our marriage problems. I’m about to the end of my rope. Any suggestions?" If your husband’s Asperger’s symptoms are threatening your marriage, and he chooses to “protect” those symptoms rather than control them, his priorities may not be conducive to a long-term relationship. If his priorities remain the same, you need to decide whether or not this is the right relationship for you. Even if he does decide to get a diagnosis, you still need a strategy to resolve disagreements. Research suggests that successful conflict resolution is crucial to an enduring marriage. You and your husband can disagree about issues, but make sure you are consistently able to settle conflicts before you go to bed at night. I receive dozens of emails every week from wives who assert that their husbands are simply in denial. The bottom line is this: Your husband has to make a choice about what he values most – (1) his marriage, or (2) refusing to seek a diagnosis. If he values his relationship with you more than staying in refusal-mode, then he will go and see if he has this disorder. If he values staying in refusal-mode more than his marriage, then YOU will need to do some serious soul-searching to decide whether you’re going to stay in this relationship or not. It is never too late for your husband to increase self-awareness in order to capitalize on strengths and work around areas of challenge. Knowing about Asperger’s can give him an explanation, not an excuse, for why his life has taken the twists and turns that it has. What he does with this information is his business, but it is still very important information to have. If your husband has Asperger’s but doesn’t know, it affects him anyway. If he does know, he can minimize the negative impact and leverage the positive. Without the knowledge that he has Asperger’s, he may fill that void with other, more damaging explanations (e.g., failure, weird, disappointment, not living up to his potential, etc.). Note: As you try to talk with your husband about this, be sure to discuss his strengths rather than just focusing on his weaknesses. Most adults with Asperger’s have significant areas of strength. If you include a lot of the positive things you see in him (that may also be related to Asperger’s), he may not feel “attacked,” thus rendering him a bit more open to the possibility of facing his fears by going for a diagnosis. • Anonymous said… Counseling does not work for Aspies. It is a difference in neurological wiring, not psychological / behavioral problem. The sooner that people come to understand that factor, the better the chance of success for both parties in the long term. Aspies are not damaged, just misunderstood. • Anonymous said… Diagnosis isn't going to change who he is. • Anonymous said… I believe Aspergers Syndrome an be very difficult for an average person to understand without some education and support. I worked in support classes for Aspies in an elementary and junior high school setting and found the many natural variations in behavior from one student to another confusing at first. My Father was undiagnosed most of his entire life and my Mom suffered from lack of support in her marriage with him, especially when they were on their own as elders. 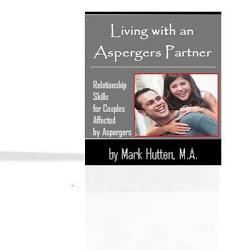 It is so important, in my opinion, for partners and spouses of individuals with Aspergers to get a good support system to meet the many needs that will never be satisfied by their partners. And as others have said here, education about Aspergers can make everyday life smoother. It isn't really about blaming one partner or another, IMHO, but being realistic about what each person wants and needs from the reationship and if those wants and needs are realisic or likely to be met. If not, can each person live with the compromises? I'm married to an Aspie and as I'm ageing I'm finding myself rethinking my future in terms of my quality of life, for example. The need for peace becomes more important later on. • Anonymous said… I'm sensing defensiveness in some of these posts. Why are you automatically taking the husband's side? She said HE blames her for blaming him....she didn't say SHE blames him. Is that not one of the main traits .... he's being defensive towards her I think is what she is saying. Give her some credit. Living with let alone being married to someone who is automatically always on the defense and takes everything personal is not the easiest thing to do. I've lived with two for 16 and 23 years, so yes, I am speaking from experience. • Anonymous said… Lol. Do what I did. Leave. He will soon realise how much he actually depends on you. • Anonymous said… Most UNDIAGNOSED men with Aspergers can't see it. Their brains won't process it. The more you push, the less likely they'll see the truth. • Anonymous said… that reaction from your partner probably stems from continual criticism from parents, (siblings), and peers while growing up. You tell someone that they are damaged goods enough times, then they are going to eventually believe it, and treat all incoming feedback, whether positive or negative, as an attack on them. Acceptance and compassion are key in breaking down barriers, and listening to what an Aspie has to say is equally important as they are human and do have feelings, too, but have difficulty in conveying them. • Anonymous said… The problem for many of us, Aspies, is that our neurodivergence is pathologised into a condition/disorder, hence the use of words such as 'diagnosis' or 'treatment' which can be extremely painful and humiliating. How would NTs react if they were constantly told they have to be diagnosed and treated to change them? After hearing that kind of discourse for the umpteenth time, you become absolutely sick of it and tend to either have aggressive reactions to it or walk away from the person using it. It's only when there is mutual respect and no intention of pathologising/changing the other that a real dialogue is possible. Why not try to discuss with your husband without placing the discussion within the framework of an opposition between Aspergers/NT, but simply as two persons with different perceptions and needs? After all, whatever our neurological organisation, we are all different and on a vast spectrum of nuances. • Anonymous said… Well if you are trying to blame him for all your marriage problems, I can see why he wouldn't be receptive. Just because he has Asperger's doesn't mean everything is his fault. NT people are plenty good at causing problems in their relationships. • Anonymous said… Yes one of the issues with Aspergus is that they usually think it is not them, but the other people in their lives who have the problem. • Anonymous said… you can bring a horse to water but cant make them drink it , my advise is to ask your husband to come to marriage counciling as nothing is what it first seems intill you both go get councilling together ,if he refusses ? i would do some serious thinking about your life and your happiness , please put the aspergers thing to one side and just ask him to come to counciling ,if he want to save the relationship he will go , but please stop mentioning asergers in the meantime ,the problem may not be anything to do if he as aspergers or not ? If he refuses to come to marriage counciling ,leave it there and find a theripist for you ,I promiss you I know what I'm talking about . As a wife-with-Aspergers married to an NT husband, I can relate. We've been married almost 11 years, and have been in and out of therapy much of that time. Here's the good news. I finally got diagnosed about 18 months ago. And since then we've been seeing a psychologist who specializes in Aspergers/Autism/ADHD. That has made *all* the difference. The therapists we saw in the past were family counselor types who didn't recognize that Asperger's was a fundamental part of our disconnect... so much of their advice just didn't help. Our current doctor is dealing with the underlying communication disconnect and helping my husband understand how my brain works and *why* I do the things I do. For the first time in years, we have both moved away from the, "I don't know if I can take this anymore" and toward tolerance and even empathy for our differences. You *can* work with it, but you've got to be willing to accept each other AS YOU ARE. Which means that the wife in this letter has to realize that hubby may be able to mitigate some of his "symptoms", but he's an Aspie and always will be and won't get "cured". Typical, even AS women are more capable of self-realization. Really sick of men everywhere. Quiz for Partners: Do You Have Asperger’s?